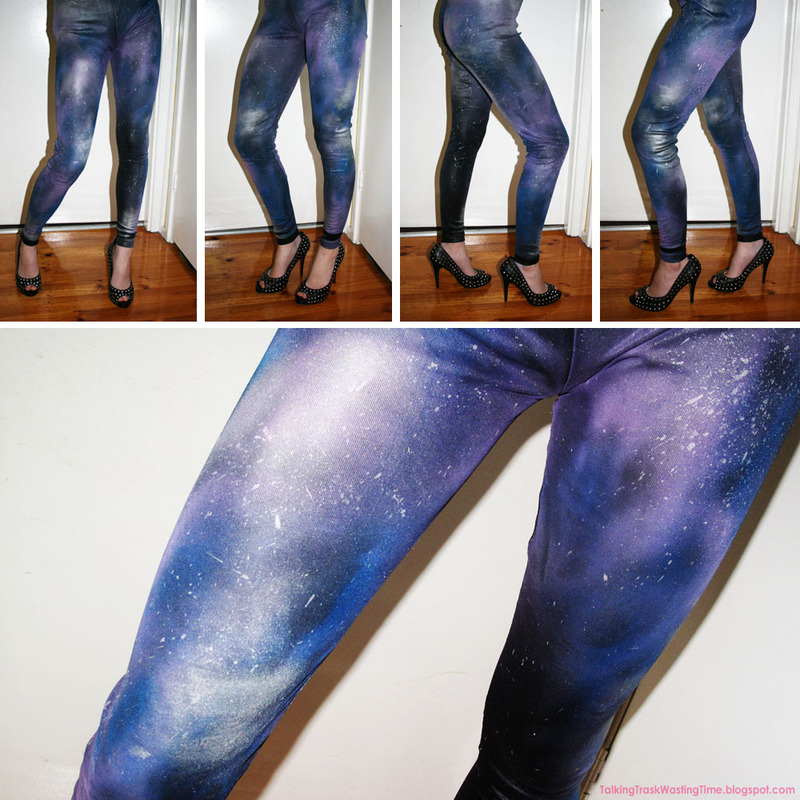 Do you need those designer leggings that look like a space galaxy but just can't justify paying over $100 for? Then this is the Tutorial for you!! For my first effort at trying to get this effect I think I almost got it. 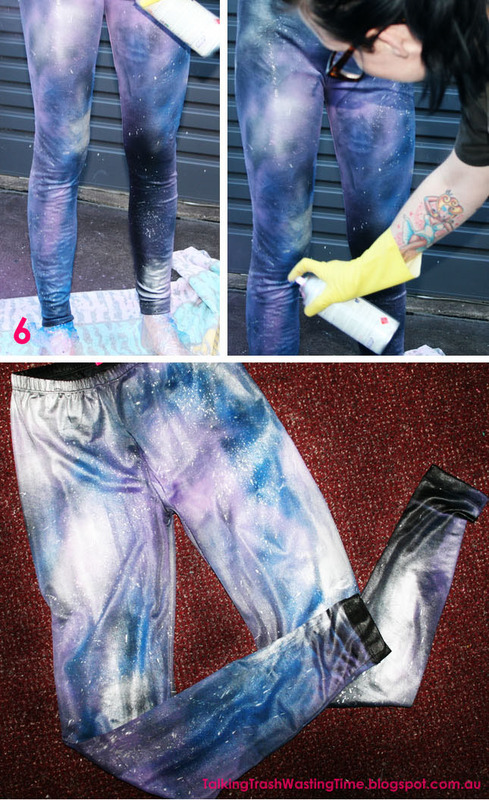 I have seen a couple of DIY Galaxy tights online but I didn't think they achieved the right look. So an experimentation was in order :) I have not used bleach like other tut's, I am not even sure bleach would work well on these shiny wet look leggings and black always goes orangish when bleached so I wanted to avoid that. Above is the finished result. I think I may add a little bit more larger stars/spots but for now they are still rocking. I have also taken a video but I do not have time to edit and upload tonight so I will try to post it tomorrow. Detailed instructions are also below. I watched this Youtube video for inspiration and and basic tips. Saves you approx 100 BUCKS!!! 2/ Glad wrap legs, feet and stomach! Wrapping a body in plastic will also make you look gross, flat bumpy bum and lumpy looking legs but no one can see you, so who cares right? An alternative to wearing them would be to put the tights on some type of tubes to create fake legs but I cbf with figuring that out so stuck with plastic glad wrap legs :) If you do not care about the design flowing then just spray flat on the ground. 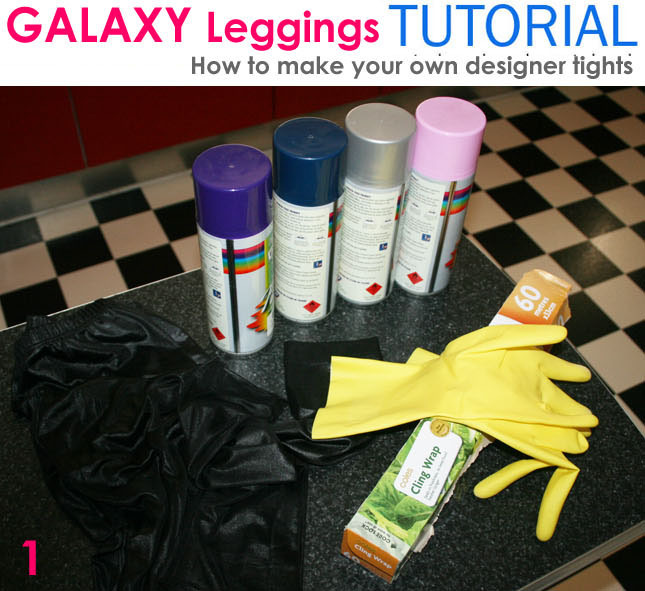 3/ Put your gloves on and using your PURPLE spray start creating a soft pattern on different sections of the legs, not spraying fully but enough to make the leggings look patchy. Go all the way around, front and back, continuing the blotchy pattern in sections. Do not do all over as you still want the black showing. You will only just be able to see the purple at this point. Look at picture to see that you do not spray all over the tights. Now do the same with the Pink but put more paint on so its brighter but leave some purple sections not covered as you want the colour to have depth. 4/ Now again do the same with the blue & again less spraying so you can see the underneath colours but enough to get the brightness of the blue. Still do this blotchy and not perfect sprays all the way around. 5/ Time for the chrome silver highlights to make it pop!! You can use white spray instead but I wanted the the stars to be shiny like stars so went with the chrome. After getting enough silver spots I then sprayed in different sections the silver, not too much though! if you want more light sections then do more but I didn't want to do too much in case I stuffed up the other layers. 6/ Carefully take the leggings off and hang to dry. Wash them when completely dry to get rid of the paint smell. Cut the glad wrap off and have a shower haha you will need it!! This paint will not wash out, at first it may make the fabric a little stiff but its soft enough to wear. Love these ... been enjoying your site so I'm nominating you for the Illuminating Blogger Award for informative, illuminating blog content. I know not everyone participates in blog awards but I hope you'll at least check it out because it's a great way to discover new blogs and meet new web friends. If you're interested in participating, you can check out the details at my site ... http://foodstoriesblog.com/illuminating-blogger-award/ ... Either way, hope you're having a great day! So, uh, you realise YOU NEED TO MAKE ME A PAIR OF THESE! So great! sososo great! well I am not sure about acrylic spray paint as it may wash out, I used the enamel only because I know it doesn't wash out of anything and you can get a shine from it. so sorry not sure. ooh. thanks for the quick reply! your leggings are really awesome by the way. :) but isn't it a bit stiff? 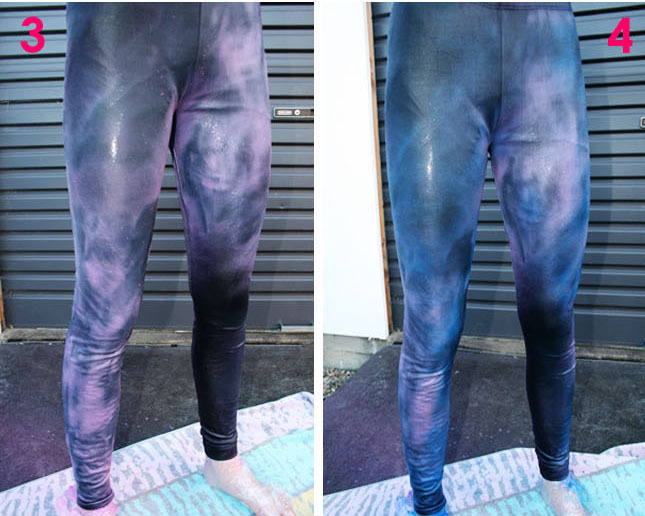 how long does the leggings become softer from the paint? Once I washed them twice they were not stiff at all really, not sure if that is because of the fabric absorption or if its just from the washing :) maybe depends on paint. 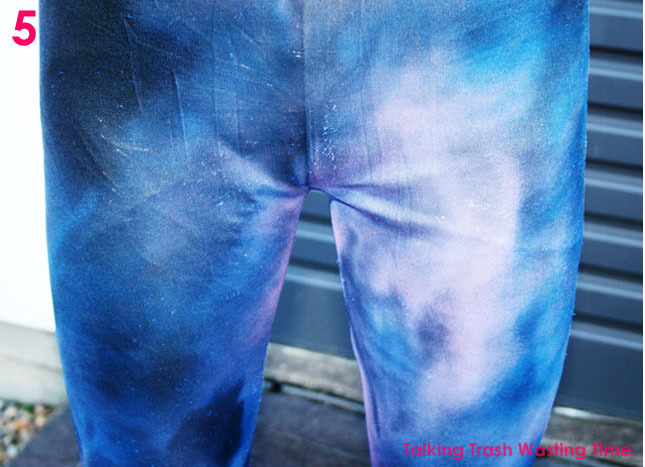 This is the one and only galaxy diy on the internet that really worked, congrats!! The others I've seen look completely fake, you did such a great job! 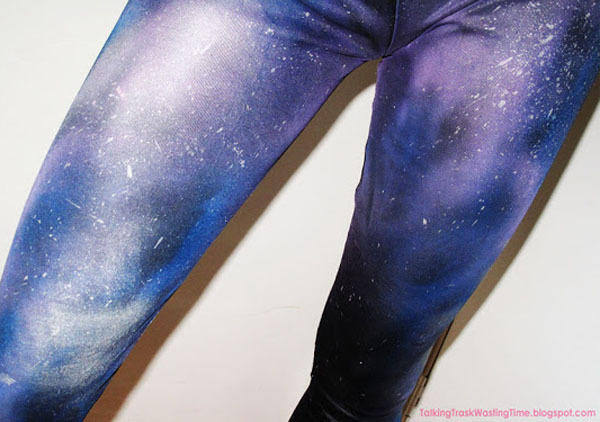 Hello, many thanks for Your Galaxy Leggings Blog , i make so a Leggings self and Your Blog and Video have me very helping !